Conducted for over 70 years, the 4-H International Exchange Program has given a multitude of Kentucky families the opportunity to host a Japanese youth in their home for 3.5 weeks during the summer. Each year, over 20 states across the country welcome 500+ Japanese/South Korean youth between the ages of 12-17 to their state to experience American culture by living with a family. Kentucky 4-H hosts 15-20 of these youth each year and is looking for potential host families. Host families who would like to host a youth for the 3.5 week summer program should have a child in the home between the ages of 11-17. They are paired with a Japanese or South Korean child of about the same age and same gender. Any family with an appropriate age child is welcome to apply! An adult chaperone travels with the delegation and stays with a host family. Anyone is welcome to apply to host an adult chaperone (singles, older individuals or couples, families with or without children). Families who host have the ability ot save credits for their child/children to travel abroad! In 2018-2019 Kentucky will host 15 youth from Japan and 1 adult and 10 youth from South Korea and 1 adult. 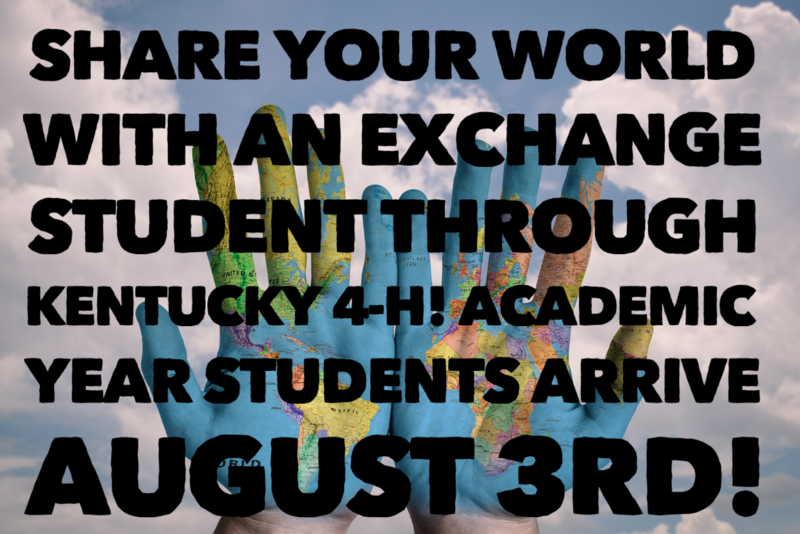 Kentucky 4-H will also host two Japanese or South Korean Academic Year Program exchange students. We are excited for this opportunity and invite you to get involved! Pick-up and drop-off are in Shelby County, Kentucky. Begins in the end of July through the end of the school year. County 4-H Programs are offered a program support stipend for placement of students, stipend may be used for the advancement of 4-H programs within the county. 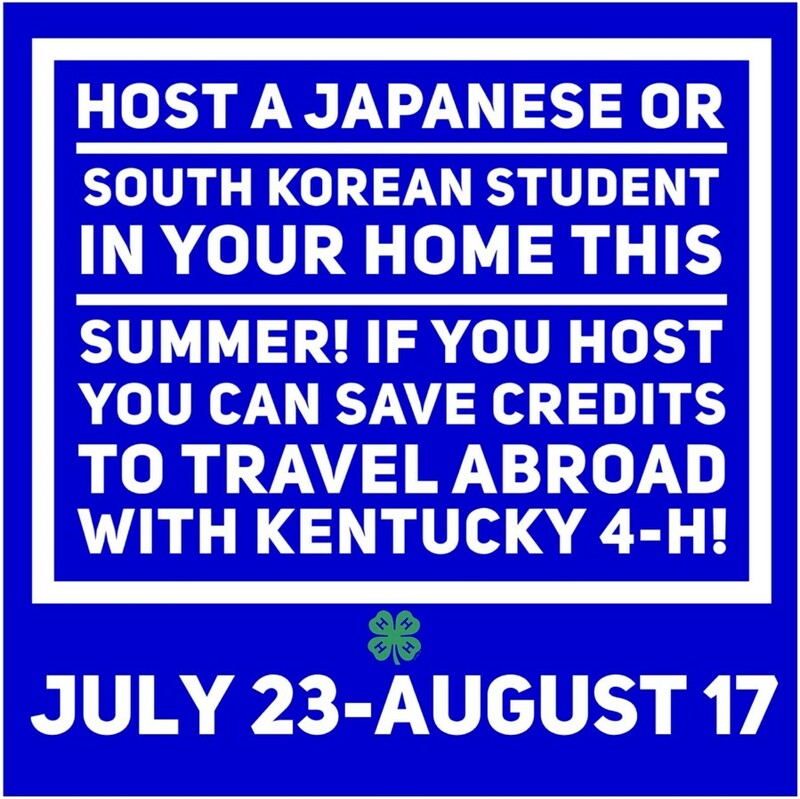 BY PARTICIPATING families can save credits for their child to travel abroad with Kentucky 4-H! The International Exchange Programs in Kentucky cannot be possible without families who volunteer to host exchange students. Click this link to sign-up!